Looks like Safari have got some cool new creatures lined up! Check out that Tyrannosaurus. And a new mosasaur? Oh man I love it! Do I also spy an azhdarchid off in the distance? Looks like it's going to be a good year! In the kingdom of the blind, better take public transit. Well, in the kingdom of the sighted, too, really--almost everyone is a terrible driver. Now that, CollectA, is how you make a feathered T. Rex. The quetzalcoatlus looks promising too. v.1 status and posts: Full Member. Wow looks like i wont need to get a replacement for my 2011 t.Rex after all. A true Dinosaur fan loves dinosaurs for what they are, not what he/she wants them to be. Original comment deleted as I fooslishly confused Safari with the defunct Carnegie line for a moment. That TRex, if sculpted as I hope it was by Doug Watson, looks like an absolute "HOMERUN"! Hopefully whoever did the sculpt above has learned from these past shortcomings, but until we actually see the entire critter, I would caution you to temper your enthusiasm. Having said that, the part of the TRex that we can see does look like it MIGHT turn out to be one of the best TRex PVC sculpts out there. So, let's stay tuned and remain cautiously optimistic. It looks obvious from the picture that the Rex is a tripod. Which is fine with me, I'd rather have an accurate tripod even if it's over done than an inaccurate big foot (or inaccurate ungulate toe walker on a base like the Collecta versions). I don't know why tripod counts as a problem? 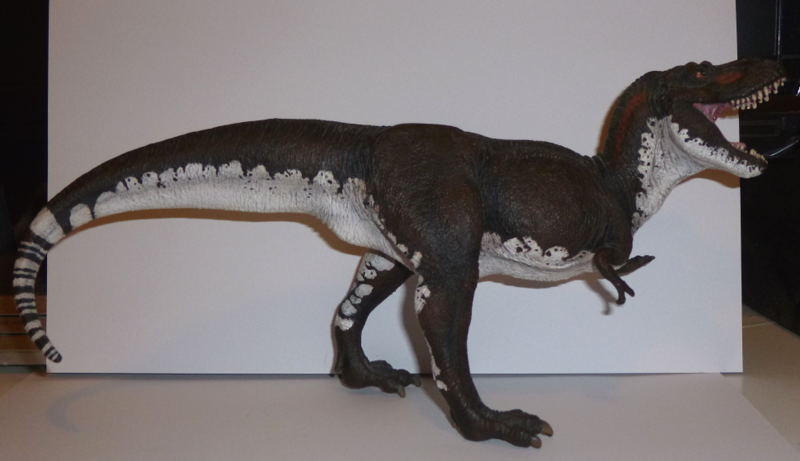 It's over done but only because it's the only stable pose for a theropod without a base. This one definitely looks like Doug's work, not Forest Rogers' - so I have higher expectations regarding the ankles and feet. I share your concerns about the tripod pose, though, Safari have been reluctant with bases. Beyond that, there are a few smaller things that trouble me. No lips, big reticulae on the face, and I fully anticipate birdlike tarsal scutes, even Doug's Carcharadontosaurus had those. Even with all those worries, I think it looks superior to CollectA's efforts so far. Original comment deleted as I foolishly confused Safari with the defunct Carnegie line for a moment. Definitely some interesting creatures in the picture! 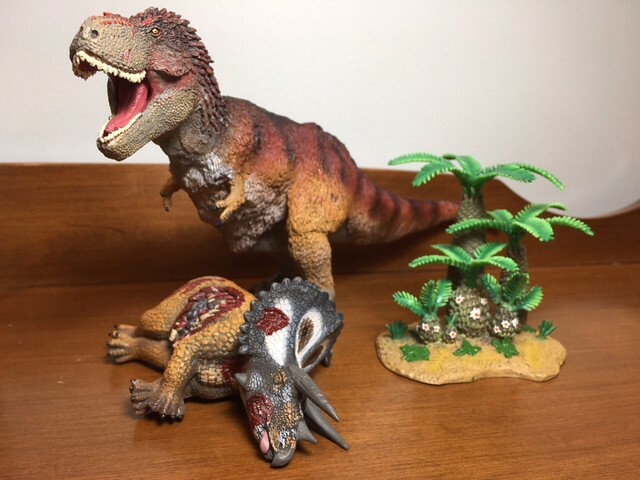 That feathered Rex looks beautiful, much better than the gaudy CollectA one. I've been holding off on some of the Safari models I like (mainly that Carcharodontosaurus....) but if the actual figure looks half as good as that preview pic, I don't think I will be able to say no! I would not rush to judgment of the stance for T rex. In the past Safari has made tilt figures that can be posed fully bipedal but played with in a tripod stance. Feathered rex looks nice! Thought following what you said Patrx, most people still don't know anout the whole dinosaur lip situation so I can forgive that. It looks fantastic! And the azhdarchid too! Beenw anting an azhdarchid from Safari for a loooong time! And the mosasaur? looks awesome too! Anybody know if there will be more to come? In case anybody is curious, yes, I am back. I've been away for a while! Anybody know if there will be more to come? Feast your eyes! Here are some of the NEW 2017 Safari Ltd. Animals, Dragons, and Dinosaurs. See any that you are excited about? Let us know and stay tuned for more! Pardon my language, but HOLY !*#%CAKES! That Feathered T. rex looks damn gorgeous. "Never laugh at live dragons, Bilbo you fool!" Really looking forward to that azhdarchid, although it would be nice if it was in a walking pose instead. The Tyrannosaurus and mosasaur look pretty good too, but the lack of lips on the former is pretty bothersome. Also, is that a hobbit I see on the right side of the image? If so, I think we can expect to hear about another lawsuit pretty soon . "The world's still the same. There's just less in it." I wonder what size that new Tyrannosaurus rex is?It seems noticeably more detailed than the usual Wild Safari line.I wonder if it could be the first in a new larger scale model series that acts as the replacement for the Carnegie Museum series?It's very nice,as are the new mosasaur and pterosaur models. Don't you hate it when you legitimately compliment someone's mustache and she gets angry with you? Dinosaur: What do you think? They'll probably call it a halfling or something similar. I wonder what size that new Tyrannosaurus rex is?It seems noticeably more detailed than the usual Wild Safari line. I dunno, it does seem somehow like it'll be pretty big, but most of Safari's newer pieces are pretty darn detailed if you take a close look. Looking at the underside of this new Tyrannosaurus' head, I think it looks like a wash of dark paint is bringing out the details, which is neat. Usually, Safari's paint applications are pretty simplistic. And the teeth on it look noticeably more fine/sharp than previous therapods from Safari; perhaps another clue that it might be a bit larger? Am I a big Allosaurus or am I a Saurophaganax? Wow!We sure are getting the news early this year! It looks like it's going to be a truly fantastic year,better than 2016,in my opinion.I imagine there are still more figures to be unveiled,but it's looking damn exciting. I personally found 2016 a bit boring for Safari ,but 2017 is looking great (just like 2015 was). Also,I've found that two of my wishes have become true.I had hopes for an updated mosasaur,though it's different as to how I imagine mosasaurs,I think of them as more whale-like creatured rather than lizard-like.I suppose it has a fluked tail. I also wanted to see am azdarchid from them,and it looks pretty cool,though it hardly can be seen. And that Tyrannosaurus...Oh well.I didn't think Safari would do a feathered Tyrannosaurus,but thanks God I'm wrong.It looks very,very very badass .It appears to be extremely accurate...more so than the CollectA version (same as with the Carcharodontosaurus).It also reminds me of the Saurian one.